To me, the myopia pattern is contracting, pulling in, backing away from everyone and everything which seems too intrusive and “in my face” to look inward instead. The myopic personality puts on energetic blinders to shut out most of the world, which feels like it’s invading her space and disrupting her peace of mind. This is the complete opposite of reaching out to engage with others and the environment, of feeling expansive. So with an eye (ha!) toward changing my habits, I asked myself when I feel expansive. When do I feel safe and centered, like it’s a joy to stretch out my energy and vision into the distance? If I know what makes me feel like this, maybe I can do more of that, and it will nudge my visual energy toward wanting to reach out too. The first thing that comes to me is time outdoors in Nature. I can feel myself taking a deep breath of relaxation, my shoulders dropping when I hadn’t realized they were raised. Yesterday I mowed my lawn and felt almost joyous to be out hearing the birdsong, appreciating the sun on my face. It’s much easier to feel this now in the Spring than it is in the Winter, when the cold weather usually makes me want to pull in rather than reach out. Inhaling deeply reminds me of doing 3D work years ago with my behavioral optometrist. I wore such strong thick glasses as a child, I had nearly no natural depth perception ability left, and had to re-learn that. After months of training with red/green cards and 3D glasses, when I could finally see the Magic Eye hidden images, it was such a triumph! When the 3D image came into view, I involuntarily took a deep breath, letting out tension, the same feeling I have when I’m outdoors and appreciating the natural world. One more example comes to mind. 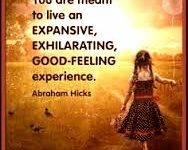 When I’m with someone whom I know deeply cares about me and will listen, without rushing me or telling me what I should be feeling or thinking, I feel expansive. It seems safe to relax, to stop protecting my energy because I’m in no danger — no predators here! I have a small handful of cherished friends and teachers with whom I feel like this, and it’s such a pleasure! So instead of asking “When do I feel expansive?”, maybe I should be asking “When do I feel safe, like I want to be here instead of escaping?”. Maybe this is really about being present and in my body. When I was a child I regularly got lost in a book, imagining those other locales and characters, oblivious to what was right in front of me. I still love to read, and can get totally absorbed in the scene the words paint. I have a vivid imagination and rich dreams. I’d like to be visually connected to what I’m seeing when my eyes are open too! So I’m coming back, yet again, to the idea that feeling expansive and relaxed (and clear-seeing) happens for me simply when I’m present in the Now moment. Since being present has been such a challenge for me, I’ve written about it before many times, hoping to understand it better and solve it. One example is here. 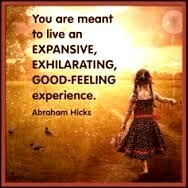 Do you know what makes you feel expansive, wanting to reach out to others, not to control but to communicate or help? The more you know what you need and put your focus there, the more likely you are to have it. That’s my game plan! Only one eye exercises made me feel that… active focusing. time by time.